Quantitative S&T data and their analysis are an indispensable foundation for formulating S&T policy, and they play an important role in S&T policy research. Quantitative data represent a key tool in grasping S&T activities that tend to be complex and reach across multiple fields, as well as in analyzing the effects and influences that policies have. Given that S&T activity is the process of producing knowledge, preparing quantitative data for this intangible process is not easy. In addition to this, close linkage to S&T activity with various other activities makes the measurement of S&T activity and differentiating it from other activities technically difficult. NISTEP understands the difficulties here, and that is why it is developing S&T indicators and conducting research in scientometrics in order to deepen application and analysis of quantitative S&T data. “Science and technology indicators” are basic resources for systematically ascertaining S&T activities in Japan and the world based on objective, quantitative data. Science and technology indicators are prepared by many countries of the world. In Japan, the first indicators were published by NISTEP in 1991. Initially, NISTEP reviewed the structures of indicator system every three years. However, since 2009, it has been emphasizing the timeliness of data by focusing on basic indicators that are updated each year. It assembles basic data that include R&D expenditure, number of researchers, and number of published research papers in Japan and major countries together with detailed explanations about meta-date of the statistics. Moreover, NISTEP not only announces “science and technology indicators” but also conducts relevant surveys and research. Since 2009, NISTEP has issued reports that, in principle, update data each year, with focus on items that allow time-series comparison as well as international comparison among major countries. NISTEP structures the reports to be as simple as possible. 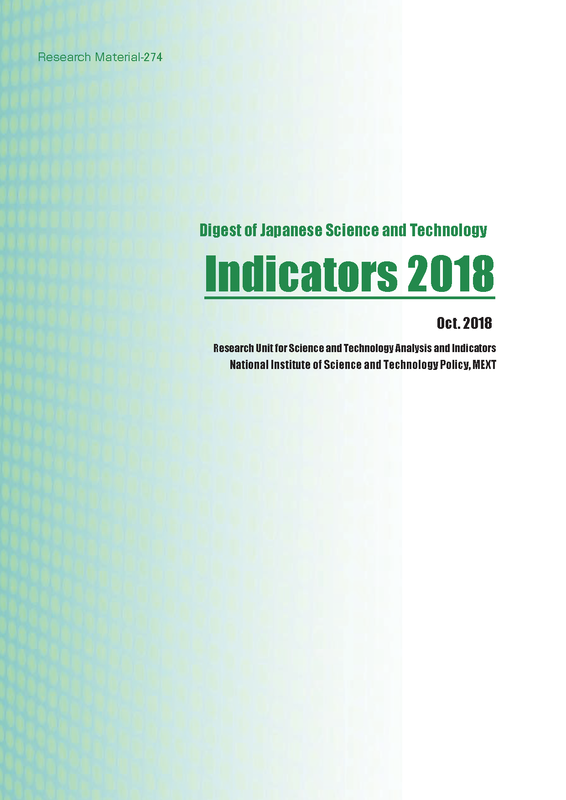 The report “Japanese Science and Technology Indicators 2018” covers five categories: “R&D Expenditure,” “R&D Personnel,” “Higher Education and S&T personnel,” “Output of R&D” and “S&T and Innovation.” Each presents circumstances in Japan using numerous related indicators. NISTEP analyzed research time of university faculty members, an area where statistical analysis had been lacking despite its importance. NISTEP is also gathering information on methods for measuring R&D statistics and related statistics for major countries. These meta-data serve as the basis for the evaluation of international comparability of the S&T indicators. As interest in evidence-based policymaking has been increasing in recent years, demands for accountability in R&D investment are growing stronger. 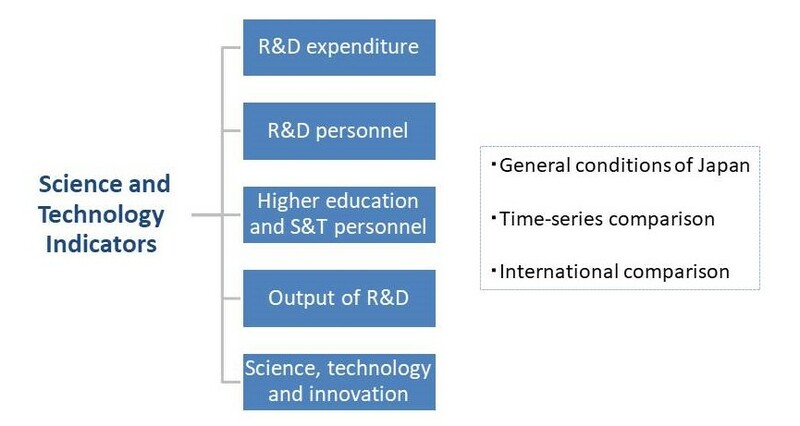 As a result, understanding the outputs of R&D as well as the processes between investment and output has become an important research challenge. NISTEP seeks to take on this challenge by using a “scientometric” approach. Specifically, NISTEP focuses on scientific publications, patents, and other outputs of research activity to conduct quantitative analyses of R&D trends and S&T levels in Japan and abroad. The purpose here is to ascertain S&T trends panoramically and quantitatively. NISTEP generates maps of science, the Science Map, every other year to find out research areas that attracts international attention by analyzing highly cited papers (papers that ranked in the top 1% in terms of number of citations in each field). Examining these research fields reveals trends in international scientific research and qualitative changes in inter/multi-disciplinary research. It also shows that Japan’s share of hot research appearing on the Science Map is declining, and highlights differences between Japan and the United Kingdom and Germany, which are expanding their participation in hot research areas. 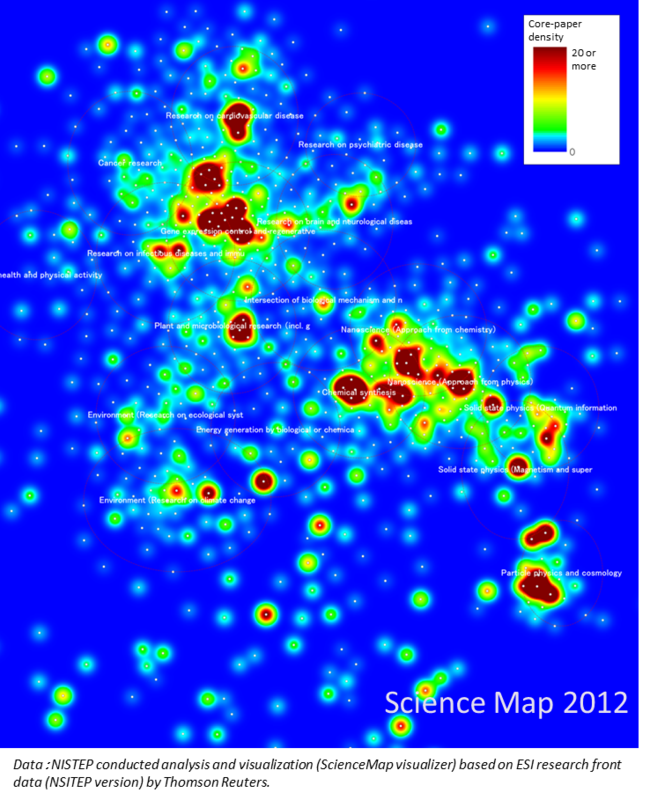 Highlight of Science Map 2010 and Science Map 2012－ Study on Hot Research Areas (2005-2010 and 2007-2011) by bibliometric method(English ver.) －[NISTEP REPORT No.159 / 2014.7]←New!! NISTEP benchmarks Japan’s scientific research by focusing on scientific publications, which are the medium used to disseminate research activity results. Using individual indicators (i.e., number of papers published, number of adjusted top 10% papers, and number of citations) and composite indicators (i.e., share of adjusted top 10% papers in papers, and relative citation index), NISTEP compares circumstances in Japan with those major countries in individual fields. It also analyzes circumstances in Japan by sector and organizational classification, as well as time-series variations of paper production in Japan. NISTEP benchmarks scientific research activities of Japanese universities to identify characteristics and strength of each university. The Research Activity Sheet of 128 Japanese universities is developed for analyzing their changing in characteristics and in time series, and compared them. NISTEP also conducts to show each university’s comparative position among its peers and to capture its world-class strength in each research field. NISTEP, Hitotsubashi University’s Institute of Innovation Research, and Georgia Institute of Technology conducted a large-scale survey on knowledge creation processes. The survey targeted scientists in Japan and the United States and received about 4,400 responses. The results of survey revealed the commonality and differences between Japan and the US in the knowledge creation in science. Engineering-oriented research is expected to play an important role in future innovation. Despite this, few detailed bibliometric analyses of such research have been available. NISTEP therefore conducts analyses of literature published by the Institute of Electrical and Electronics Engineers (IEEE), the world’s largest academic association. Based in the United States, IEEE publishes one-third of the world’s engineering literature and is highly influential in standardization and other activities. The aforementioned analyses allow NISTEP to clarify international researcher movements and changes in technical trends from its own unique vantage point. NISTEP analyzes the characteristics of and changes in patent application trends for the world and major countries, with particular focus on patents that can be measured as outputs of research activity. It then reports the results as science and technology indicators. NISTEP also conducts the following analyses that target universities and public research institutions. NISTEP also conducts analyses of specific fields, analyses that target developing countries, and analyses of industry-academia collaboration. No notices are currently posted. No relevant links are currently posted.